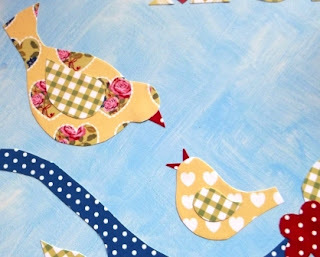 Welcome to the first Handmade Monday of 2013 - and a very Happy New Year to you! I hope 2013 is everything you hope for and more. 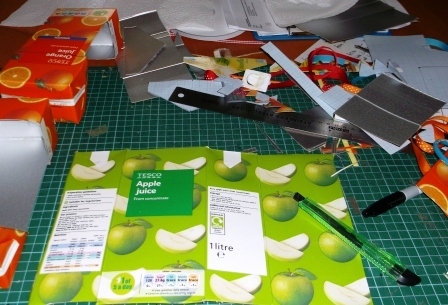 Yes, there are chopped-up Tesco juice cartons on my cutting mat! Here's a confession: I've been drinking lots of juice from cartons just so I could use the cartons in a project for Craftseller magazine. Yes, I bought them specially. I even ended up decanting apple juice into bottles so I could use the cartons because we just couldn't drink it fast enough! I know the whole point of - ahem - upcycling these tetra-paks is to use something that would otherwise be thrown away. But hey, I had a deadline to meet and that will have to serve as my excuse! I think maybe I'm still on the tail end of Hurricane Christmas (it certainly felt like a mad whirlwind - hand making gifts to order has its drawbacks at this time of year, and people still carry on ordering after the big day). But I'm sure it will all slow down soon enough. Being so busy means I haven't yet made plans for the new year. There is something new and quite exciting happening though! I've been asked to be a regular contributor to a new blog from Craftseller magazine. The party has started without me over at Craft-seller's new website, but I'm sure I'll catch up soon (I warned them I'd be arriving late: I knew that hurricane was on its way!). The website is already looking really good, with lots of input from lots of different people. Be sure to check it out! Please leave your link below and I will pop by as soon as I can. We have visitors staying at the moment, some of whom are quite small and I don't see as often as I would like ... so forgive me if I get distracted! Congratulations but when will you fit everything in? You already seem to be busy the whole time! (Which is a good thing I know!) I think your idea of a bird feeder is a great idea - just because it is on the internet doesn't mean anything as most people will be like me and have never, ever thought about re-cycling these cartons. Happy New Year, Wendy. Hope all is settling down after your hurricane! I'll have to catch up with the birdfeeder idea - sounds great. I'm glad you had a successful, if overly busy Christmas Wendy! How exciting to be involved in the Craftseller blog, i will pop over now via your link to have a look at their site. Wendy... I too have the spam comment issue, such a nightmare! Anyway, I would just like to say how chuffed I am when I see your name in print. I can see how hard you work on the projects and they always look so cool... Congrats on becoming a staff writer! hmmm those cartons look intriguing. You will be getting part of your five a day for a while yet then!! Another magazine well you do some amazing work so I'm not suprised. Happy New Year to you wendy! Hope you had a lovely Christmas. Wish you lots of crafty inspirations and plenty of time and zest to complete them. congratulations on joining the craft seller's designing team. well-deserved! Looking forward to seeing your feeders and congratulations on your good news. Well done with your Craft Seller blogging - looking forward to cat chin-up with you on there. Hope you have a good week. How exciting for you to be contributing to the Craftseller magazine blog! They are quite lucky to have you. Love those little birds, but then, I always like what you do. I have missed seeing it as last year simply got away from me with all the busyness of the new grandchild etc. Hopefully I'm getting back on track. Thanks for all the comments. Lovely to have Handmade Monday back - it's a bit like coming home after some time away! The break is good, but it's great to be back too. I'm still working on getting around all your blogs - there have been a lot of things demanding my time this week. Thanks so much for your comments and sorry I've been so slow in replying and visiting everyone's blogs. It's been a busy time with babies, birthdays, visitors and dreadful migraines (fortunately not mine this time - my visiting daughter's, which turned me into chief baby minder, although that did have its wonderful and lovely side).